You’re not alone – as just one part of a support team, we talk to carers all the time and whatever situation you’re in, you will find other carers who know what you’re going through – physically, emotionally, financially. Brain Injury is BIG is a registered charity and support group for family members of people with severe brain injuries. Their online forum and telephone helpline offer peer-to-peer support. 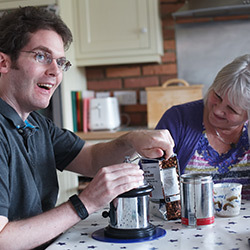 Visit their website here or call 01483 770999 (9am – 9pm) to speak to other carers of brain injured people – they know exactly what you’re going through.